With numerous holidays being celebrated from November through January, many family traditions and rituals include decorations and lots of new objects for your loving pets to get into. Following are some Do’s and Don’ts we hope will help keep everyone safe and merry during the most wonderful time of year. If a Christmas tree is a part of your family’s celebrations, beware of all the tantalizing opportunities it offers your pets. Tree water, shiny objects, hanging tinsel or blinking lights can be beacons in the night for our four-legged and winged friends. 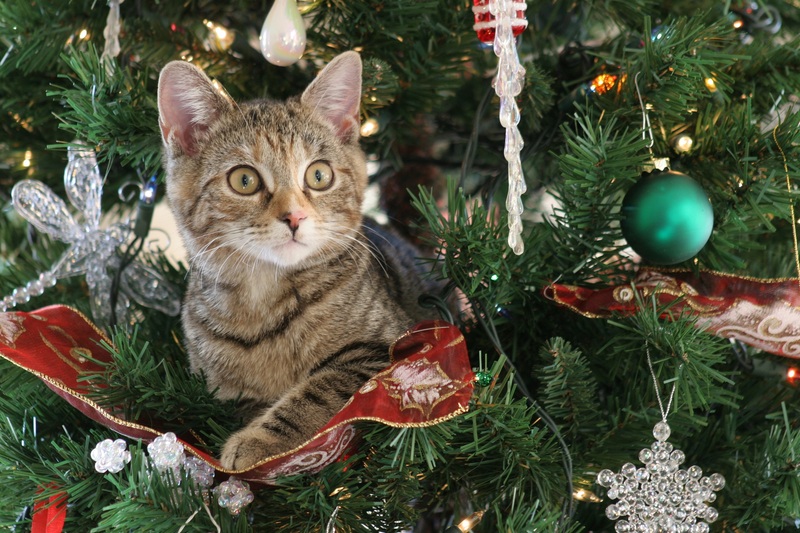 Placing the tree in an area your pets can’t get to will help to preserve the beauty of your tree and the health of your little ones. 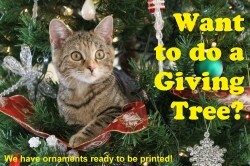 If not, try to create barriers around the tree and always supervise your pets when they are near it. If the Festival of Lights fills your house, make sure to keep your pets away from your menorah. A wagging tail or jumping cat can knock over candles and easily start a fire during your Hanukkah or Kwanzaa celebrations. Scented candles filling the room with aromas of spices or pine? Not if you have a pet bird! Birds have very sensitive respiratory systems and scented candles can cause health problems. Resist the urge to give your pets table scraps and watch them around your trash cans. Animal bones from dinner can be a tempting but potentially deadly treat. If you live in or visit an area that gets snow and ice, make sure to put snow shoes on your dog before going on a walk. Not only can frostbite occur in paws, but salted sidewalks can lead to pad irritation and dry-out. The cold isn’t only harmful to dogs; a neighborhood cat might find solace in the warmth of your parked car engine. If your neighborhood is prone to outdoor or feral cats, check before you start your car by pounding on the hood or honking your horn. In the effort to keep pets warm, sweaters and animal-specific clothing can come in handy. If your pet is wearing their finest holiday threads, keep an eye on them around open flames, other animals or children. And as always, dressed-up pets should be under constant supervision. Don’t put tags on just your gifts! As with any other day, your pets should always wear their collars with ID tags. With many holiday guests coming and going, it is easy for your furry family member to slip out a door or gate. However you choose to celebrate this holiday season, we hope it will be filled with peace, joy and celebration for all! Happy Holidays!